I am entirely new to the Arduino (but I'm familiar with programming). In order to built a VU meter, I want to put a microphone to the analog 0 pin of the Arduino and display the value via the serial connection. The values on the serial monitor don't change depending on the music volume. 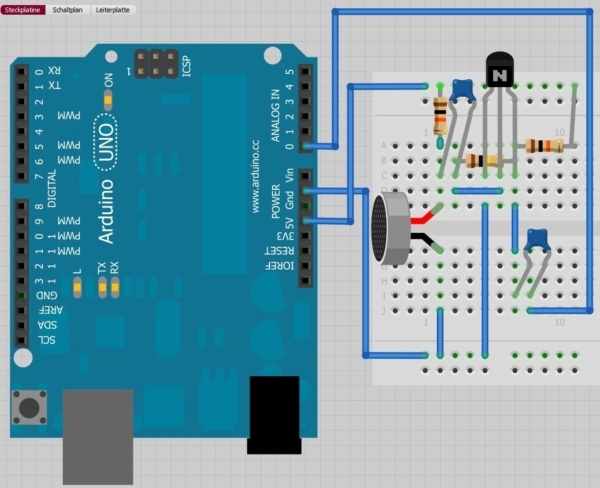 What is the easiest way to measure the volume on the analog input of the Arduino? Also, I have a TDA2822M, but I don't know if it is helpful for this project. The caption on the microphone reads XF-18D. How can I check if the microphone works at all? Is it directional? Edit: I am now using a S9014 transistor. The ADC and the serial connection work (I tested them with a potentiometer). The serial output is now around 57. Also, I don't have a multimeter or oscilloscope. I have a multimeter now. If you want the RMS level of the signal then you will need to calculate this at some point, either before sending to PC or afterwards. 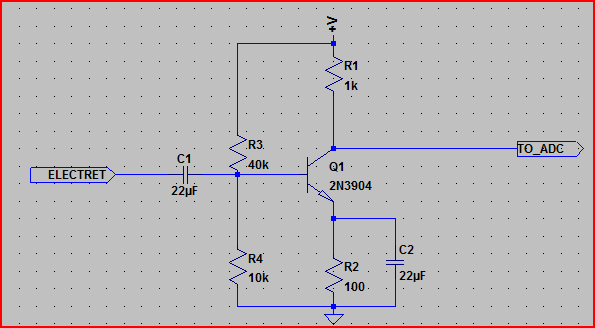 Your amplifying circuit as shown is not ideal, but should work reasonably for a basic VU meter. EDIT - I just noticed C2, remove this as it will block the DC bias from the transistor, and the signal will swing below ground. This shouldn't care too much about the transistor used, the output bias should be around 2.5V. R1 and R2 do need to be these values though. One point of concern is the Arduino 3.3V and 5V lines seem to be tied together - I'm assuming this is a schematic error, but if this is the case in the actual circuit it will not work, and may damage something. To pinpoint the problem(s) it would help to see your code, and what you are seeing on the PC side. Also what transistor are you using? Also you need to make sure the RS232 is working correctly, so writing some simple code to send some test values would be a good idea. If you can provide the requested info, and let us know what tools you have available more specific help can be given. The diode can be just about any diode. The cap and resistor values are just a guideline, they can be changed a bit. Their values dictate how long the voltage will take to change with the signal level. You can calculate this using the RC constant (i.e. R * C - in the above example, the RC constant is 1e-6 * 10e3 = 10ms. The voltage will take around 2.3 time constant to fall by 90% of it's original value, so in the above example if the voltage starts at 1V and you remove the signal, it will have dropped to 0.1V around 23ms later. EDIT - okay, think I found a major problem. 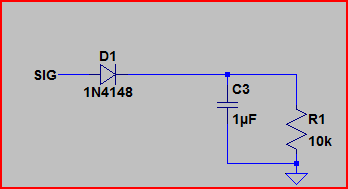 Your S9012 transistor is a PNP transistor (as is the S9015), you need an NPN transistor for this circuit. The S9014 is an NPN transistor, so you will have to use this one. The capacitors marked "104" are almost certainly 0.1uF ceramic capacitors. The value (in pF) is the first 2 numbers followed by a number of zeros set by the last number. So for 104, the value is 10 + 4 zeros, or 100,000pF. 100,000pF is 100nF or 0.1uF. If you replace C2 (not strictly necessary but a good idea), you should be able to feed the signal into the PC directly and observe in the software to see if the microphone and amplification are working correctly. If your PC has line in use that, but the microphone input is usually good for up to 2V IIRC. You could also test the electret directly - just remove the transistor bit and keep R1 and C1, take signal from the other side of C1. Note that this method will not test the DC levels, only the AC (due to a DC blocking cap in the souncard input) but the AC (audio) signal is what you are interested in here. If you try this, post the screenshots so we can get an idea of what's happening. Assuming your circuit works the audio signal is in the kHz range while the Arduino has an ADC suited for DC levels. 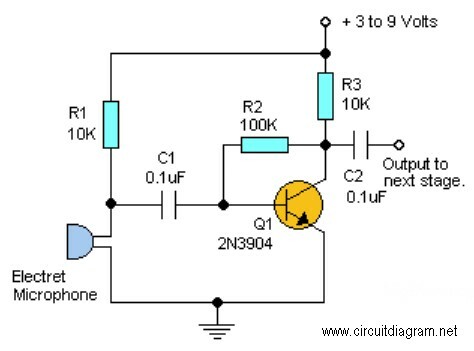 The DC component on your signal is zero which is to say that it floats over a fixed voltage. It is that fixed voltage that your ADC is reading. To fix that you would put a diode in series with your output connecting to the ADC and to a capacitor and resistor. The cap will charge to the peak value being received while the resistor will discharge the cap when the signal dies down. Edit: The ADC input is actually floating as it has no bias whatsoever due to the series capacitor. If you're going to try my solution delete C2. Your readings of 1022, 1023 are basically full scale on the Arduino's ADC. Assuming you installed a non-faulty series capacitor as shown in your diagram, this level cannot be coming from the microphone circuit you built, since that can only couple changing voltages (ie, AC). As a result, I suspect you are reading leakage current within the ATMEGA itself - you would probably get the same result on any of the other (unconnected) analog pins. 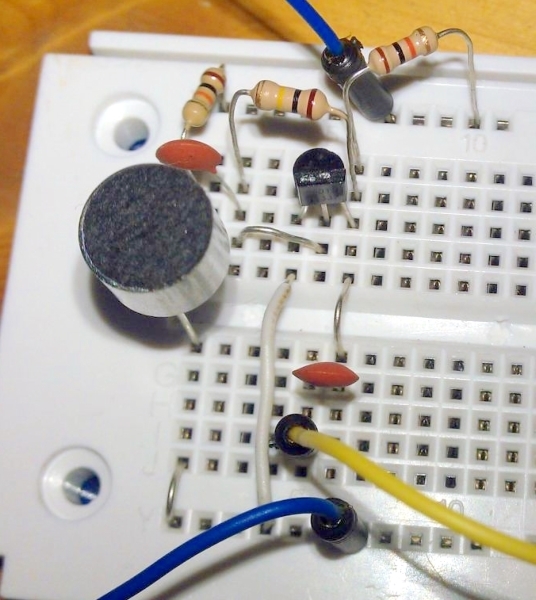 Try making a very "lightweight" voltage divider with some high value resistors (between 10K and 100K) and use this to bias the analog input to half the reference voltage (you could also use a potentiometer, which gives you some extra testing capability). Then your reading with no input should be in the neighborhood of 512. Once you have the ADC input suitably biased, you can start working trying to see if you get variation through it. You may be undersampling your bandwidth some, which means you will get aliasing of high frequency components, but if all you are trying to do is estimate overall volume that should not be too much of a problem. Not the answer you're looking for? Browse other questions tagged arduino audio microphone or ask your own question. 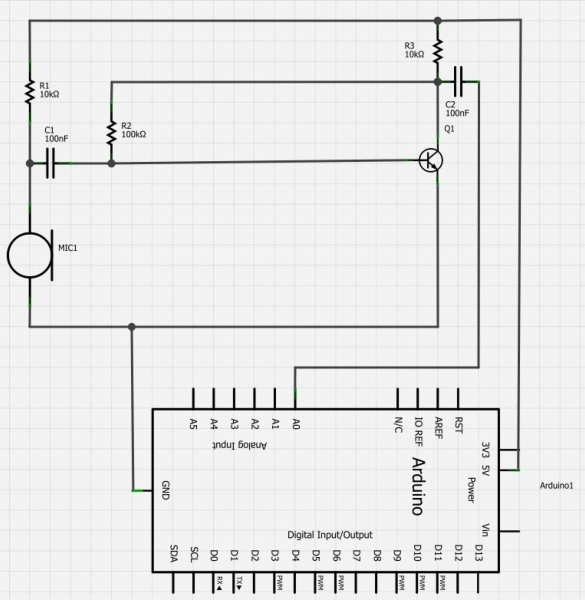 Audio amplifier controlling volume with Arduino? Boosting a microphone for a noisy, low sensitivity input?